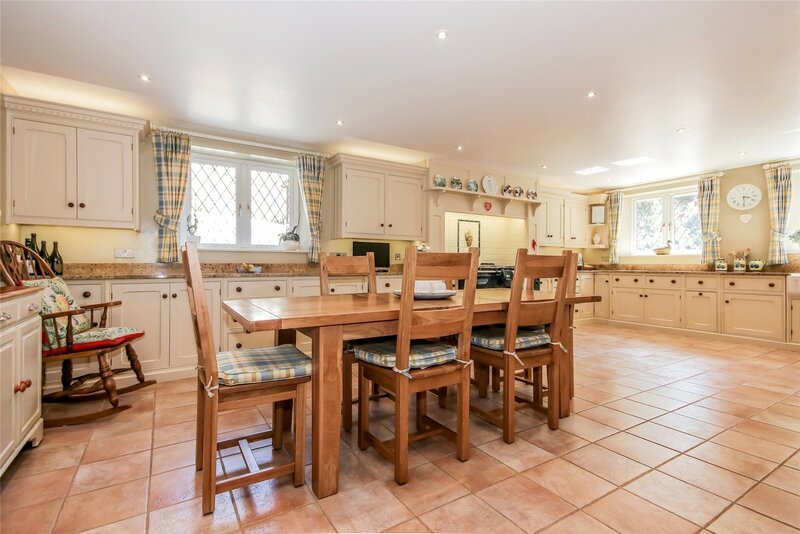 A truly stunning, extended detached 5 bedroom property which was formerly the laundry house for Langdon Court. 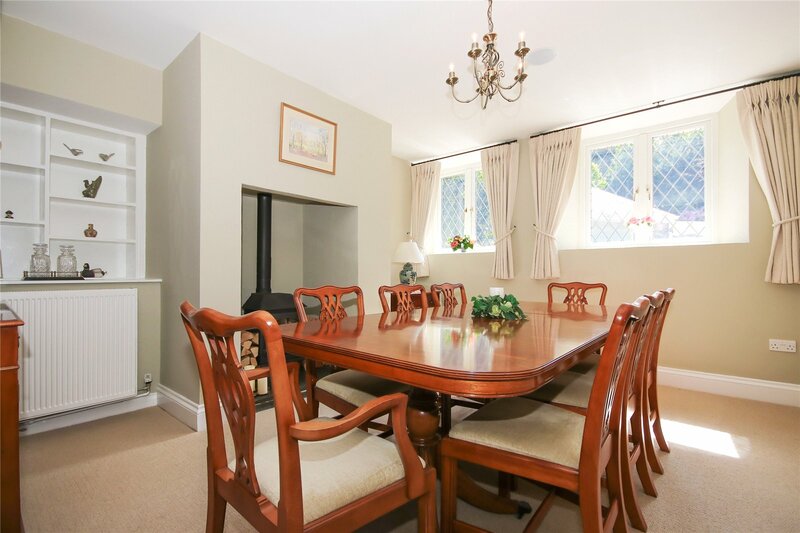 Refurbished to an exceptionally high standard with generous well-proportioned rooms. 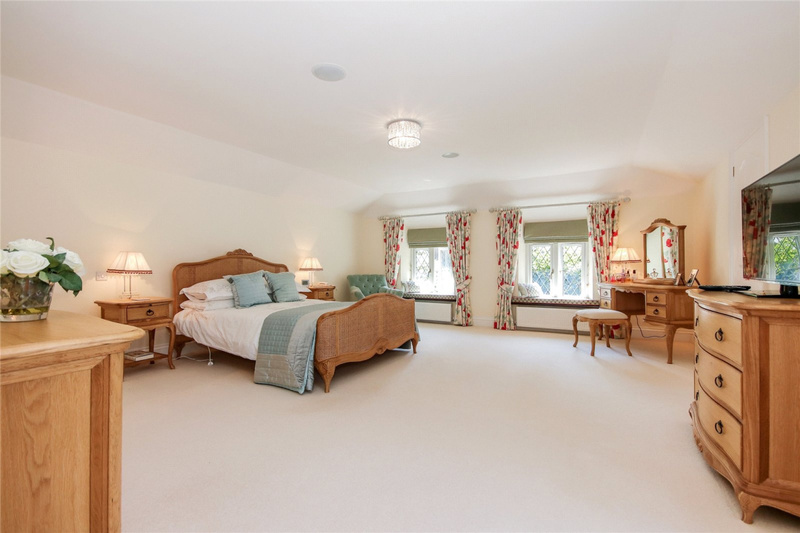 Impressive master bedroom suit with ensuite and dressing room. Large farmhouse style kitchen. 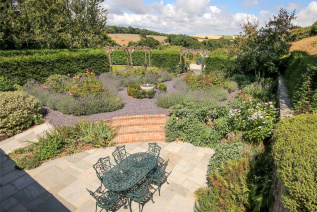 Landscaped gardens with wonderful views over surrounding countryside. 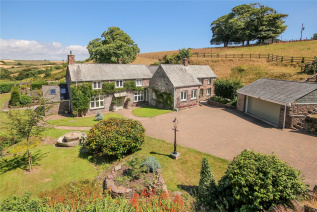 Paddock extending to 2.37 acres and stables. Laundry Cottage is set in the attractive historic hamlet of Langdon and was formerly the laundry cottage for the Langdon Court. 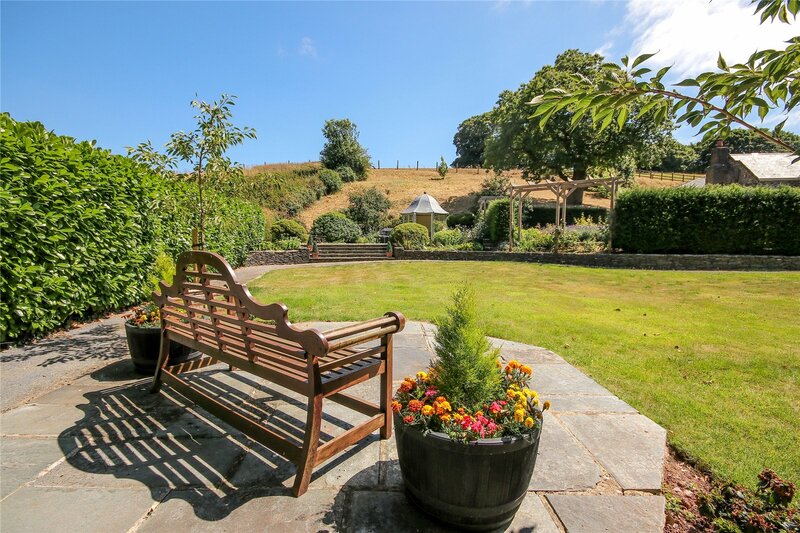 Along a private sweeping drive, you approach this stunning period property which is set within 2.37 acres of landscaped gardens and paddocks. A substantial property extending to 4,000 sq. ft. providing generous rooms, including a fabulous kitchen/breakfast room, dining room, drawing room, study and sitting room. The property also offers 5 bedrooms, with a luxurious master suite including a dressing room and fabulous en-suite. 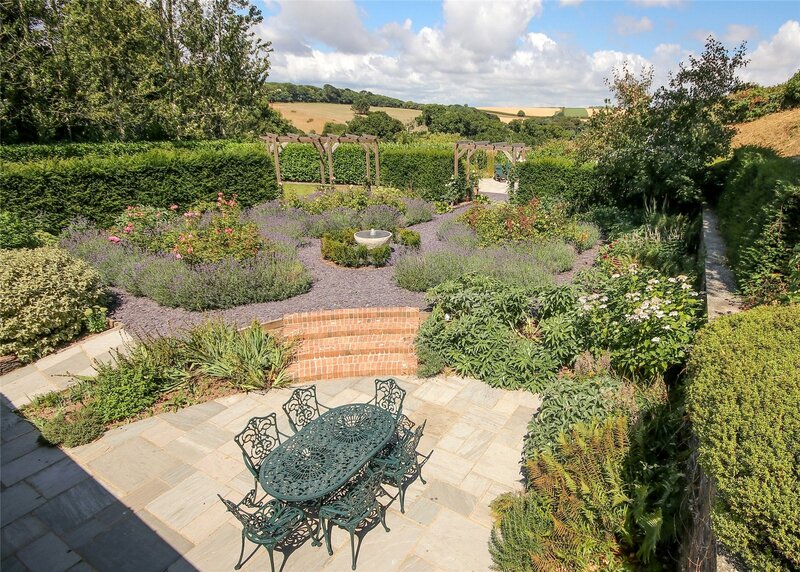 Outside the gardens have been thoughtfully landscaped with beautiful rose gardens, a kitchen garden with raised beds and relaxing seating areas to enjoy the stunning country views. There is also plenty of parking and a double garage. 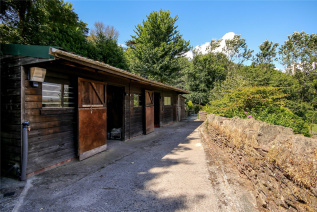 Beyond the gardens are stables and small paddocks perfect for either a pony or for those who would like a small holding. The property is a short distance from the coast. 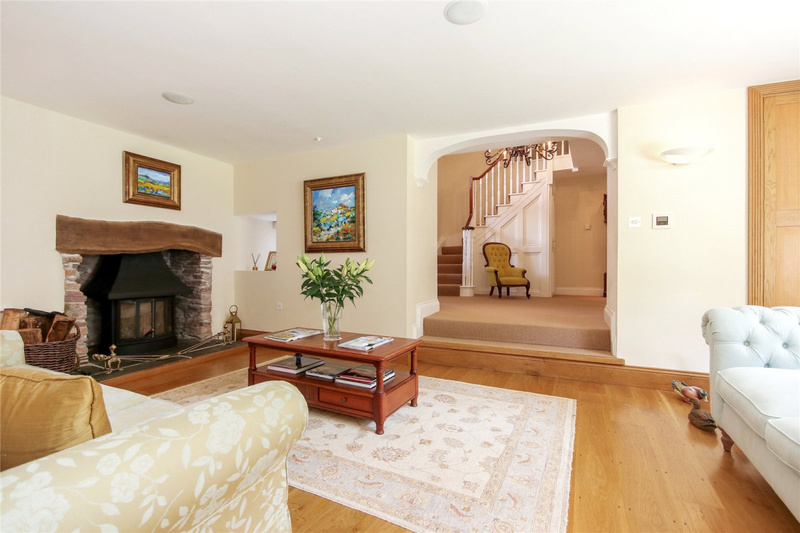 Stairs to first floor, oak flooring and built-in under stairs cupboard. Oak flooring, triple aspect windows and exposed stone fireplace with fitted wood burner and rustic timber lintel. Built-in cupboard, housing the sound system which supplies music throughout the house. Open archway to the inner hall. Window with window seat and high level window above, stairs to the first floor galleried landing with built-in under stairs cupboard. Part tiled flooring with door to the side, shelving and two sets of part glazed double doors to the kitchen/ breakfast room and dining room. A beautiful room having a fireplace with slate hearth and fitted wood burner. Dual aspect windows and alcove shelving. A spacious room with dual aspect windows and tiled flooring. AGA double oven with electric module, tiled surround and mantle above. A comprehensive range of fitted units with granite worktops and a double Belfast sink. Integrated appliances include a built-in double fridge-freezer with ice maker and chilled water dispenser. Underfloor heating. Double doors to the garden. Fitted units to three walls, Belfast sink, granite worktops, space and plumbing for washing machine and tumble dryer. Oil fired boiler. Window and tiled flooring. Wash hand basin, WC, tiled walls and flooring. 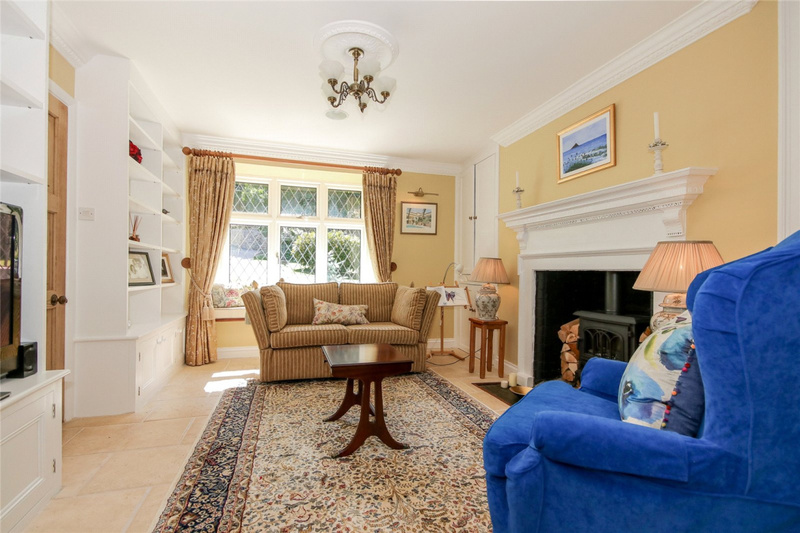 An elegant room having ceiling cornicing, fireplace, original painted surround and fitted with an electric wood burner effect stove. Alcove storage cupboards and fitted display shelving. Travertine tiled flooring. Triple windows and part glazed door to the rear garden. 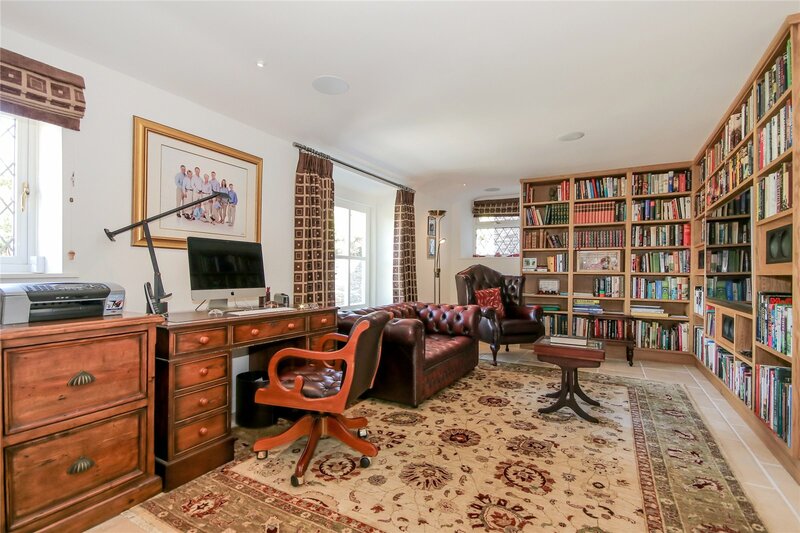 Bespoke full height oak library shelving to three walls with built-in television and home cinema. Travertine tiled flooring. Underfloor heating. Sloping ceiling with skylights, heated chrome towel rail and cupboard housing a second boiler. 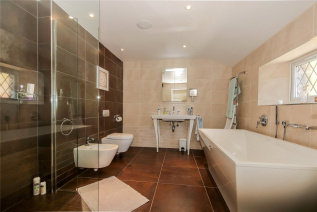 Fully tiled with walk-in shower, wash hand basin, WC, chrome towel rail and window. Beautifully lit with dual aspect windows, painted balustrade and timber rail. Another spacious room with triple windows, two windows with window seats. With part sloping ceilings with skylight, fitted wardrobes to one wall and linen cupboard. 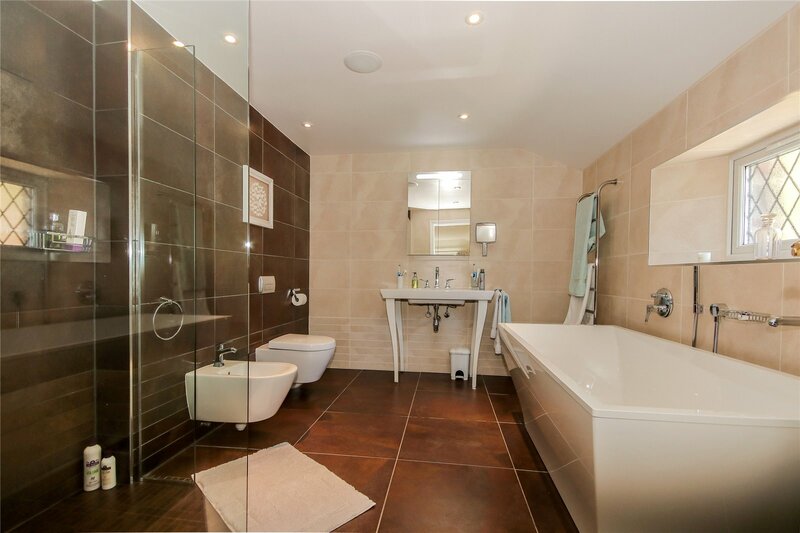 A stunning fully tiled bathroom with freestanding bath, walk-in double shower, wash hand basin on a stand, bidet and WC. Window and chrome heated towel rail. Dual aspect windows with views to the gardens. Dual aspect windows providing lovely views, built-in wardrobe and alcove shelving. A single bedroom with window. A spacious and bright room with dual aspect windows with window seats and wonderful views. Freestanding roll top slipper bath and walk-in double shower with shower screen. Wash hand basin set on a wooden stand, WC, chrome heated towel rail, mirrored bathroom cabinet and travertine flooring. A tarmac drive leads you down to a wonderful approach to the property with views to open countryside beyond. The brick paved parking area provides ample parking with a double garage to one side, having remote operated electric roller door. The beautifully landscaped gardens have lawned areas with well stocked planted borders. 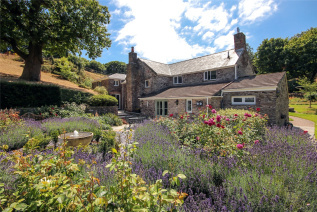 To the rear is a stone paved patio with brick steps to a formal slate gravelled area having planted rose beds edged with lavender and a central water feature. 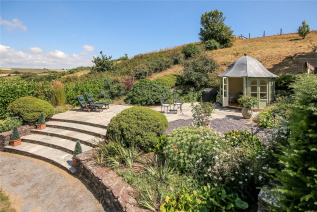 A timber pergola leads through to a more private patio with summerhouse and wonderful views to open countryside. There is also a vegetable garden with greenhouse. 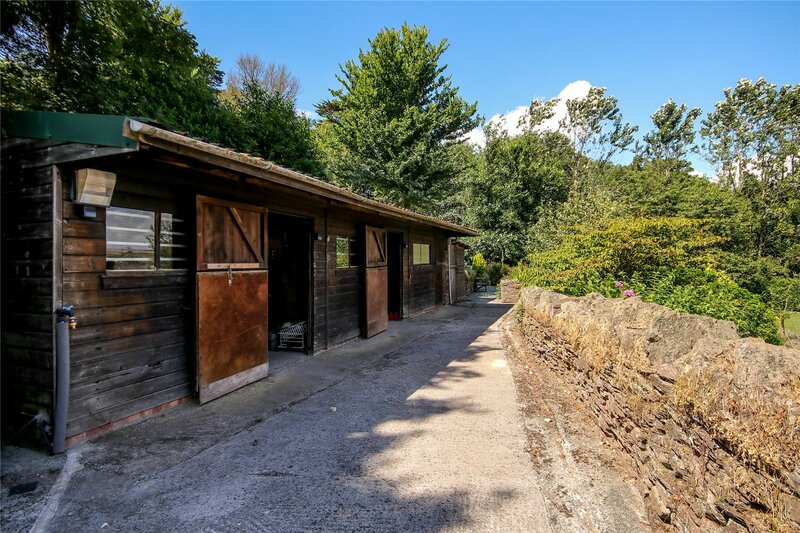 Off the drive is a paddock, timber stable block with three stables and a wood store. Mains water and electricity. Oil fired boilers providing hot water and central heating. 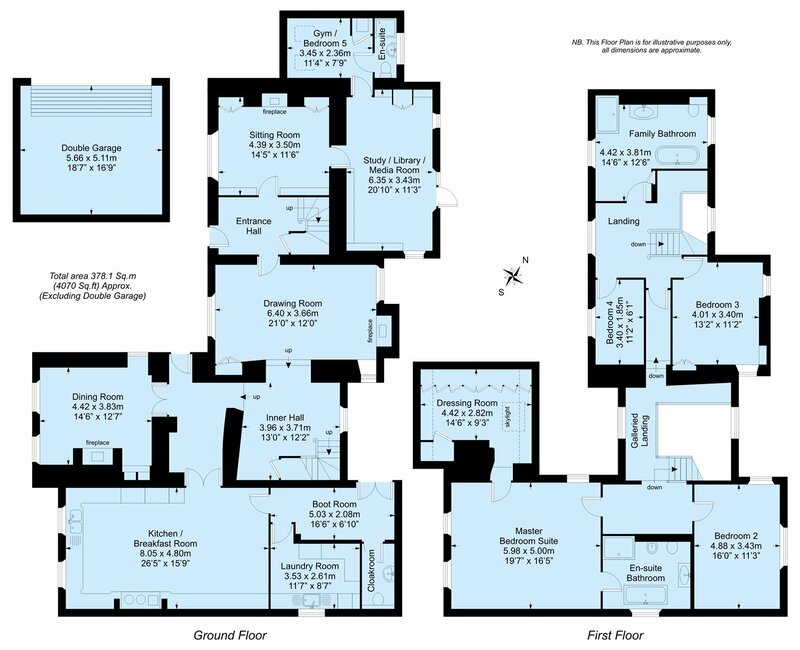 Underfloor heating in the kitchen/breakfast room, hall and study/library/media room. Private drainage. The property also has photovoltaic solar panels, providing an income of approximately £1,575.00 per annum (based on the past 12 months). 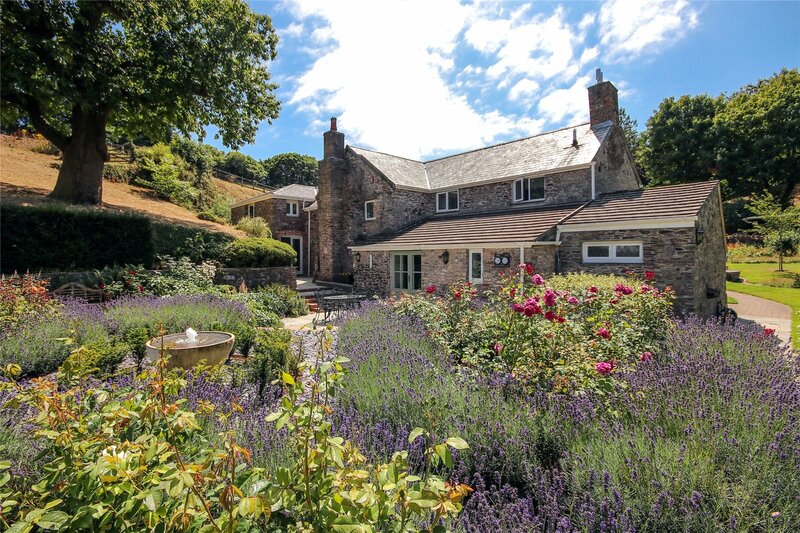 Very strictly by appointment only through Marchand Petit (Newton Ferrers office). 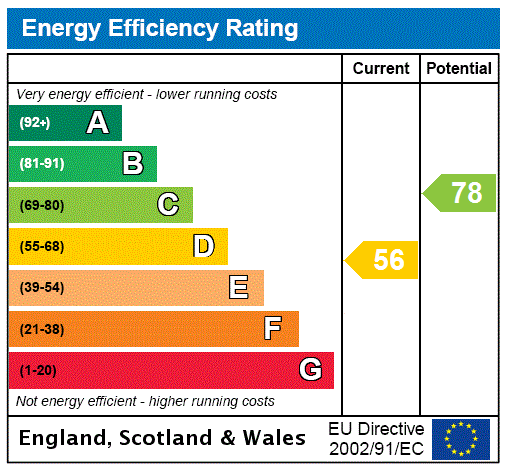 Tel: 01752 873311. From Plymstock head east heading towards Down Thomas and continue on this road towards the Langdon Court Hotel. After Passing through Staddiscombe village continue towards Down Thomas, shortly after passing Raneleigh on the left there will be a turning left to Langdon - take this driving past Langdon Court Hotel. After a short distance the entrance to Laundry Cottage will be found on the left.